Washington could become the first state in the nation to place a fee on carbon emissions from polluters. Voters will decide next week on Initiative 1631, a ballot measure that would have the state collect money from the biggest emitters of carbon dioxide and use it to fund a variety of environmental and clean energy programs. In response, major oil companies and industry-funded think tanks have launched a multi-million-dollar campaign to blanket the internet and airwaves with distortions and misinformation intended to erode support for I-1631. After a carbon tax bill failed to pass the state legislature earlier this year, the Alliance for Jobs and Clean Energy assembled possibly one of the broadest and most diverse coalitions ever to get a carbon fee on the November ballot, including more than 200 clean energy and environmental groups, labor unions, community-of-color groups, tribal nations, and others. The diversity of this coalition is no veneer. 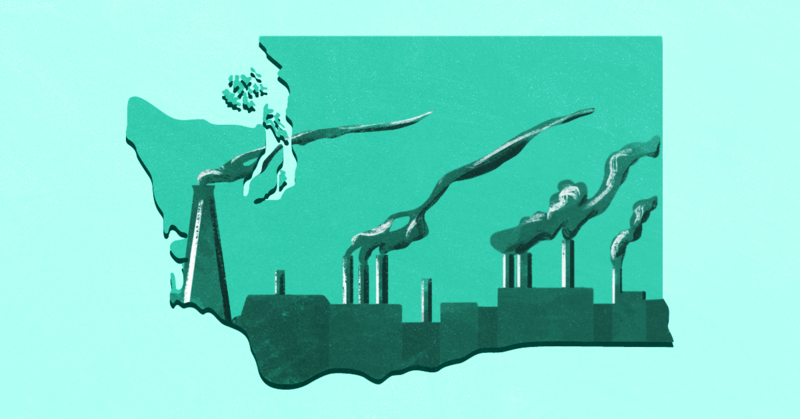 Unlike previous attempts to pass a carbon price in Washington, I-1631 was developed around the principles of environmental justice, community health, and public oversight, and grassroots organizing was pivotal to getting it on the ballot. The coalition’s initiative would impose a carbon fee on major polluters that would start at $15 per metric ton in 2020 and gradually increase over time. The fees collected, which are projected to amount to $1 billion in the first year and $2.3 billion over five years, would be used to implement clean energy and efficiency projects, assist low-income communities’ transition to a clean energy economy, reduce carbon emissions in the transportation sector, and increase awareness of climate change and its impacts, among other programs. Despite the failure of carbon tax Initiative 732 in November 2016, a poll taken after its defeat found that 67 percent of voters supported I-732 or “a better measure” to address climate change. As support for a new and improved ballot initiative began coalescing this spring, the oil industry was watching -- secure in having stopped federal action on carbon pricing, but afraid of the domino effect if states like Washington start implementing their own climate policies. The competing PAC that is supporting I-1631 has only raised about half as much -- $15.6 million -- and its money has come from a wider variety of sources, including environmental groups and individuals in Washington state, like Bill Gates, as well as from out of state, like Michael Bloomberg. The unprecedented tens of millions of dollars Big Oil has poured into the "no" campaign have allowed it to blanket social media and local television airwaves with anti-1631 propaganda. Over just the two-week period from October 16 to October 29, the No on 1631 PAC spent more than $1.1 million on digital advertising. Most of this money seems to have been gone to Facebook advertising. As of November 1, No on 1631 was running 71 Facebook ads, which have garnered millions of impressions. Most of the ads feature the No on 1631 logo with a single, misleading talking point and a link to the PAC’s website. To implement its online media strategy, No on 1631 retained the agency BASK Digital Media, which has worked for a number of other conservative groups and campaigns this year, and marketing and advertising firm Target Enterprises, which has also done millions of dollars of work for Republican candidates and conservative groups this election cycle. No on 1631 is spending big on TV ads too. During the two-week period from October 16 to October 29, it paid Target Enterprises about $6.2 million for broadcast and cable/satellite advertising. Its ads have run on at least 20 television stations throughout the state. And it has spent $2.1 million on direct mail during the same period. The No on 1631 PAC has also run a letter-to-the-editor campaign and helped place anti-1631 op-eds in newspapers across the state. Some anti-1631 op-eds have been written by Todd Myers, a longtime industry shill who is currently the director of the Center for the Environment at the Washington Policy Center, a Koch-funded conservative group. As one of the most vocal opponents of I-1631, Myers has given multiple media interviews, been cited in other anti-1631 pieces, and debated environmental advocates over the initiative. A number of other right-wing groups, some of them funded by or linked to the Koch brothers' network, are also fighting against the initiative, either as part of the main "no" campaign or independently, including the Association of Washington Business and the National Federation of Independent Business. Hundreds of thousands or even millions of people may have viewed the "no" campaign's TV and Facebook ads, which range from disingenuous to outright dishonest. Many of the talking points in these ads come from a Washington Policy Center report that has also been promoted by the Association of Washington Business and other groups opposed to I-1631. One such ad features small-business owner Sabrina Jones, who tells viewers that I-1631 “exempts many of the state’s largest polluters.” A fact check by KING 5 News found the ad failed to mention that the TransAlta coal plant, the primary exempted facility, is already scheduled to close permanently in 2025, thanks to a deal previously reached with the state government. As The Atlantic reported, additional regulation of the plant would delay its closure date. In No on 1631’s most-aired commercial, former state Attorney General Rob McKenna blasts the initiative while failing to disclose that his law firm represents Chevron, a major funder of the "no" campaign. McKenna misleads viewers about I-1631’s expected impacts on residents, citing a state government report that projects $2.3 billion in fees will be collected from polluters over five years and misrepresenting that figure as meaning Washington residents will pay $2.3 billion in higher costs -- a vastly overstated claim, even if polluters try to pass along all of their costs to the public. Most recently, the No on 1631 campaign has been aiming disinformation directly at the Latino community. According to Seattle alt-weekly The Stranger, “No on 1631 sent out a mailed advertisement to Spanish speakers across Washington state. It contained a list of Latino businesses who were opposed to the carbon fee, who were in favor of No on 1631. Most of those businesses had no idea their names were on that list.” Some of those businesses expressed anger after finding out about the mailer, according to an environmental justice activist. Will voters be swayed by Big Oil's propaganda? The oil industry's donations and the "no" media campaign have both ramped up in recent weeks, likely spurred at least in part by an early October poll that found 50 percent of voters supported I-1631, while 36 percent opposed it and 14 percent were undecided. Big Oil is desperate to stop Washington from becoming an example of successful, grassroots climate action.